Downton is a very attractive Wiltshire village with 13th century thatched cottages and village greens. It is surrounded by water meadows and chalk downlands and straddles the Hampshire River Avon just outside the New Forest National Park. The river occasionally floods the village and major flood defence work was done in 2002. The water meadows, fields through which irrigation channels were made using weirs and channelling, use the water from the river. The village accommodates a co-op, several small shops, four churches and four pubs. It is also home to Hop Back Brewery which moved from Salisbury in the early 1990’s and is one of England’s award winning breweries. Until the last century Downton’s industry had been agriculture. Tanning was also an important industry in the 14th century but did not survive and although a new one was built in the early 19th century, making leather for harnesses and saddles, it finally closed in 1998 and has now been converted into housing and retirement homes. The Millennium Green is a ten acre green meadow and floodplain and a place for everyone to relax and enjoy. 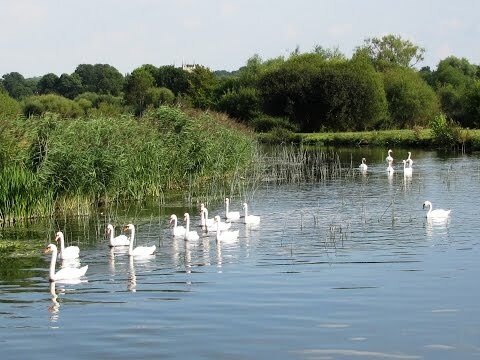 There are mown paths for a stroll to see the birds, animals and plant life in their natural habitat or sit and watch the swans gliding up and down the river. There is also plenty of space for children to play or to have a family picnic. The Moot Garden, situated on the remains of a Norman motte and bailey castle, is an 18th century ornamental garden overlooking the river. The Moot itself is a registered Ancient Monument which was once the meeting place of Wiltshire Saxons and local parliament. The garden adjoins the River Avon and visitors can take a lovely walk along its edge or around the medieval bailey mound and see the lake and the wonderful setting of the amphitheatre. It is owned by a charity and mostly managed by volunteers and is open to the public free of charge at all times. Downton’s annual Country Fair where livestock would be traded and agricultural workers would seek employment was abandoned after the First World War. In 1980 it was replaced by the Cuckoo Fair which is held on the village greens on the Saturday nearest May Day. Traditionally the arrival of the cuckoo was seen as the beginning of spring and the Downton tradition of “opening the gate” to let the cuckoo through is the basis of the fair. The fair which attracts up to 20,000 people features 250 craft stalls, demonstration stalls and plenty of other interesting stalls in the marquees then there’s the farmers produce market, Maypole, Morris dancing, line dancing, street entertainment, music and the Downton Brass Band. There is also lots of fun for children including Punch and Judy, clowns, bouncy castles, roundabouts and much more. It is also well known for its fishing, its award winning local brewery and a place for exploring the River Avon and the New Forest. The Heritage Trail launched in 2008 provides a guide to the history of the village via a number of viewpoints supported by a free leaflet and local signs. A more detailed guide of the village history and both on the trail itself and beyond is available to buy from the High Street post office priced £3. We park at the side of the road near the park and public toilets and head forwards through the village and cross over three bridges. We then take a detour to the left through the retirement homes, the site of the old tannery, to view the church. We then head back to the road and take another detour to the right before the bend and the telephone box to view the river. We return to the road again and continue through the village past the King’s Arms and the Wooden Spoon pub. Then just after the little shop we turn left onto Barford Lane. We keep following the lane until the lane bears sharp right we take the stone track on the left with a sign for Trafalgar Fisheries. We follow the track past the fisheries until we come to a t-junction of tracks and a bungalow on the left we turn left and follow the track past a house on the left and an old church on the right opposite. Staying on the track we bear left down to the mill then follow the path as it turns right next to the river. We cross over two small footbridges then over the weir and then over two more small footbridges. We then head slightly left over the field taking the left fork in the path towards the houses and the fence line. Keeping the fence on our left we head forwards then turn left over the stile at the side of a gate. We cross over the gravel track go through the gate opposite then head forwards through the fields. When we come to a track at the side of a farm on the right we go through the gate and head forwards on the concrete track until we come to another farm on the right. We turn left over the footbridge then turn right and follow the path through the water meadows back to the main road through Downton. We turn right and make our way back through the village. This is an easy flat walk on public footpaths and tracks. There is a pavement through Downton village. Approx 4 miles allow 1½ hours using OS Explorer Map 130, Salisbury and Stonehenge. Start point: Downton village hall near the children’s play park and public toilets. Downton is about 6 miles south of Salisbury in Wiltshire. From the M4 take junction 13 and head on the A34 (dual carriageway) past Newbury and Whitchurch. Then at a main roundabout take the third exit onto the A303 (dual carriageway) to Andover. After passing Andover continue on the A303 then take the A338 at a roundabout to Salisbury. Stay on the A338 through Salisbury heading towards Fordingbridge and Ringwood. After about 6 miles turn left at the traffic lights for Downton Centre. Parking: Road side parking only. There are public toilets in Downton and for refreshments there is the co-op, several shops and four pubs The King’s Arms, The Wooden Spoon, The White Horse and The Bull.